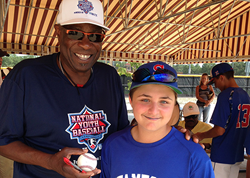 Dusty Baker meets with a young player at the 2015 National Youth Baseball Championships at Baseball Heaven in Yaphank, N.Y. Number one is teamwork and good sportsmanship, and also perseverance and the fact that you know you’re not always going to win, but you’re striving to win every game. And above all, enjoy life. Steel Sports, which operates and manages youth sports and exercise businesses including the National Youth Baseball Championships, Baseball Heaven, and UK Elite Soccer, announced that Washington Nationals manager Dusty Baker was named to the newly formed Steel Sports Advisory Board, along with other prominent figures in the sports world. These sports and coaching luminaries act as Steel Sports ambassadors promoting the company’s mission of improving the youth sports experience and enriching children's lives. Steel Sports CEO David Shapiro recently sat down with Baker for an exclusive interview. Baker shared how he continues to utilize the lessons he learned from his parents and mentors both on and off the field and looks forward to being a mentor to todays’ young athletes. As Dusty Baker puts on his Washington Nationals uniform and takes that familiar spot on the baseball field, he carries with him 40 years of experience as a professional player and manager. However, it’s the 19 years that preceded his first pro at-bat that truly shaped Baker into the man and coach he is today. Growing up in Riverside, Calif., and then the suburbs of Sacramento during his high school days, Baker’s parents always encouraged him to get outside and play sports and they always made sports available to him and his siblings. The Bakers had a basketball hoop on top of their garage, a baseball field in their huge backyard, a skateboard and bicycle. Sports were front and center and a part of their family and culture. Organized sports were just as prevalent as the neighborhood pickup games, and most of the influential people in Baker’s life were youth coaches who set him on the right track. His dad was one of those major influences along with his high school basketball coach, Eli McCullough and his American Legion baseball coach, Spider Jorgensen. Jorgensen played for five seasons in the majors with the Brooklyn Dodgers and the New York Giants. He debuted with the Dodgers on April 15, 1947, batting seventh and playing third base. Another Dodger was also making his first appearance – Jackie Robinson. Despite playing for the Dodgers and coming up to the bigs with Robinson, Jorgensen never mentioned it. He was an influence to the young Baker without the grandiose storytelling, and Baker continues to use the lessons he learned from his youth coaches in his professional and personal life. Baker was drafted by the Atlanta Braves in 1967 and made his debut the following year as a 19-year-old. He went on to amass a 19-year career with two All-Star selections and a World Series championship in 1981 with the Los Angeles Dodgers. He has two children, Natosha and Darren, with the latter in high school and turning 17 next February. When it comes to parenting, he took one message from his parents and applied it to his own style. One of the things Baker has seen with some of his son’s youth coaches is the pressure to specialize in one sport. Whether it’s baseball, basketball, football or any other sport, Baker firmly believes there’s one way to eliminate the rapid spread of specialization in youth sports. Lately, Baker has been engaged with kids and youth sports through the Positive Coaching Alliance and Steel Sports. He gives his time to both organizations through their advisory boards, and he was on hand for this past summer’s National Youth Baseball Championships at Baseball Heaven in New York. Baker helped coach during an All-Star Game and met and talked with numerous youth players over the course of the Steel Sports event. Steel Sports aims to promote a lifelong enjoyment of sports and instill the core values of discipline, teamwork, safety, respect and integrity. Once Baker learned what Steel Sports was all about and most importantly, met the people involved, he did not hesitate to get on board. After a two-year hiatus from the game, the Washington Nationals hired Baker as their manager on Nov. 3. He's tasked with leading a talented team that fell short of lofty expectations in 2015, and after the first month of the season, the Nationals sit atop the National League East division. From the moment he put on the Nationals uniform, Baker’s main mission is gaining the trust of his players. Baseball, perhaps more than any other sport, teaches players how to deal with failure. Even the best hitters in baseball fail seven out of 10 times, and Baker tries to pass that determination and perseverance he learned as a kid on to players both young and old. Founded in 2011, Steel Sports Inc. is committed to improving the youth sports experience and enriching children's lives. Our organization recognizes the value that sports and fitness has in providing meaningful and life-changing experiences for our nation's youth. We operate and manage participatory and experience-based businesses in the youth sports and exercise marketplace, emphasizing a positive and fun environment while instilling our values of discipline, teamwork, safety, respect and integrity. The Steel Coaching System is implemented with each portfolio company to ensure our coaches are educated and prepared to have a positive impact on our athletes. Our core businesses include: the National Youth Baseball Championship, the country’s premier travel ball championship for ages 9U-14U; Baseball Heaven, a 30-acre baseball complex in Long Island; and UK Elite, one of the largest soccer programs in the country offering programs such as summer camps, coaching services, teams and tournaments.